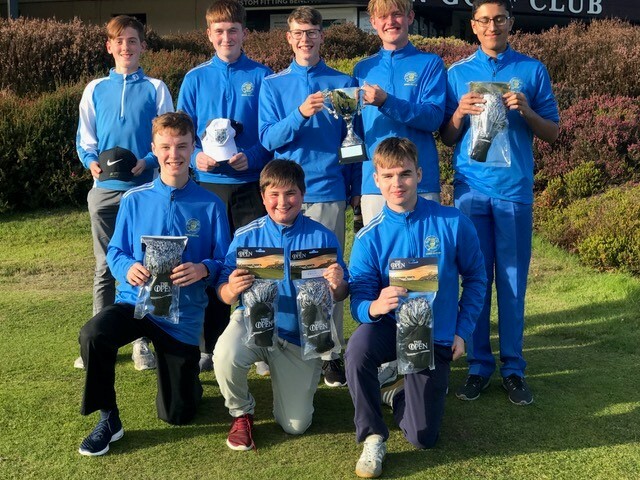 Portlethen Golf Club won the 2nd Scottish Junior Team Championship at their home course on Sunday. The format was Stableford, off full handicap, six players to a team with the best five out of six scores to count. The Portlethen team amassed 179 points, and pipped a strong Gullane team who scored 174 points. Muckhart were third with 165 points. The CSS was 37 points. Competitors from the field of nine teams came from all over Scotland. Below is a picture of the winning Portlethen team of six plus their two reserves with the trophy and their prizes supplied by the R and A. Left to right, back row – Mackenzie Mullen, Ritchie Smart, Finlay Wallace, Brandon Simpson (Junior Team Captain), Pranav Maganti. Front row – Murray Sinclair, Evan Fulton, William Lloyd.